Even though I am an English teacher, I've always loved history and have harbored more than a little jealousy towards my colleagues who get to steer students through The Punic Wars, The Italian Renaissance, and the Disco Era. There's a scene in the seminal movie about teaching Teachers (with Nick Nolte) when the history teacher, who just happens to be a literally crazy man who wanders in off the street, dresses up as George Washington and has his entire class re-enact the crossing of the Delaware: students are frantically rowing and looking out for Redcoat spies, while he stands dramatically at the prow of the boat, barking, "What river are we crossing?" I've always wanted to be that guy...minus the dementia. That kind of energy powers the graphic novel RESISTANCE, BOOK 1 by artist Leland Purvis and writer Carla Jablonski which follows a French brother and sister who are suffering under the German occupation in "free" France in 1942. Paul, the older brother, is a compulsive artist who misses his father, a German POW. One the most interesting conceits of the book is his periodic compulsion to replace the people he talks to with the energetic, scribbly versions he creates. His sister Marie is a younger, tagalong girl who is given to histrionic displays and speaking in ALL CAPS LIKE THIS. When their best friend Henri's Jewish parents are taken by the Germans, the three friends band together with the French Resistance to reconnect Henri with his parents. A story like this always labors under the mighty influence of Anne Frank. It's difficult to tell a story like this without thinking of her and her family hiding in a Dutch basement. However, the perspective here focuses more on the French gentile children than directly on the plight of the Jews themselves. Paul and Marie join the French Resistance for personal reasons rather than lofty We Must Overcome motivations. Similarly, one of the smartest choices the writer makes is to have Henri react to his parents' abduction with less than stoic determination; he's naturally whiny and sulky. 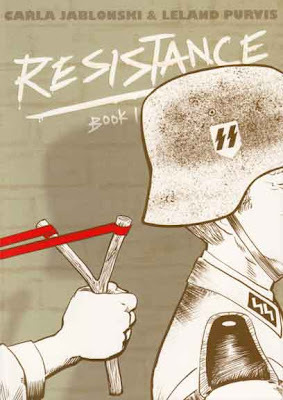 For students, I think the utility of a book like this is that it presents the French Resistance as a story, as a battle that even the children had to fight. Knowing, for instance, that part of France was "occupied" and another part was "free" is much less important than seeing what that meant on the ground as Paul, Marie, and Levy try to slip into Paris. Adults might find that the complexity of motives hinted at in the short essay that ends RESISTANCE isn't reflected in the characters of the story, but the kids feel authentically kid-like throughout. They're irritatingly sulky and strangely heroic in their attitudes towards the German occupation. We grasp history best in the stories of the people who live it, and graphic novels like this make me wonder if all of our middle school history textbooks should be replaced by short graphic novel historical fictions. I can imagine Paul and Marie navigating the streets of Paris, avoiding the mobs screaming for Marie Antoinette's blood. Either that or we have transform our classrooms with imaginary guillotines and scream out "What should we let them eat?" Realistic and expressive, the art conveys the child-centered attitudes of the protagonists with the added interest of Paul's drawings interspersed.